Home Pokémon Go	We Were a Part of a Pokémon Go Ex Raid Field Test. This is What We Learned. We had the honor on Saturday of participating in a field test of Niantic’s newly conceived EX Raid. Below is a quick rundown of what we learned from being a part of this special event. What is the EX Raid? This is an invitation only gym raid battle where Niantic decides who will participate based on a player’s level of gym raid activity/success at the location where the EX Raid is scheduled to take place. The goal of each player is to defeat and capture Mewtwo. How do I know if I’ve been invited? You will find an invitation in your list of gym badges. The invite will be attached to the gym badge that represents the EX Raid location. Do I have to purchase a special raid pass? No. Niantic will automatically add a special EX Raid pass to your item listing. What time will players arrive at the venue? It’s assumed that everyone will be excited about being part of this special event and eager to start battling Mewtwo as soon as he hatches. This means that it’s best to arrive early before the EX Raid is scheduled to take place, so you won’t miss out on all the fun. Is gym possession important at the EX Raid? Yes. Just like with any raid, gym possession prior to an egg hatch does allow players from that team to receive more pokéballs for catching. With this being an invite-only situation, it’s really hit or miss as to how many members will show up from each of the 3 teams. Individuals do have the option of arriving at the EX Raid location extra early to take possession of the gym for their team. However, if you are greatly outnumbered by people from another team, the likelihood of being able to keep your gym is not very good. Is there anything I can do in order to increase the amount of pokéballs I receive to catch Mewtwo if my team is not in the majority? If you see that your team is not in the majority, you can consider breaking off into two different groups, depending on how the team member numbers work out. For example: We had a group of 23 people and split our group in 1/2. One group was comprised of 12 Valor members. The other group of 11 were a mix of Instinct and Mystic. When we split the group, Instinct and Mystic players had opportunity to contribute more to their specific battle, which, in turn, increased their odds of receiving more balls. If you do have two groups trying to battle in a raid at one time, 1 of the 2 will need to set-up a private group with a special code. What’s the maximum amount of pokéballs I will receive to capture Mewtwo? We can’t say for certain if it’s possible to get more, but the maximum amount anyone in our group received on Saturday was 12. Those who received 12 were a part of the team that had gym control and contributed the most in the battle. What is the least amount of pokéballs I might receive? It appears that 7 is probably the least you will receive. This number is based on the amount of pokéballs given to those in our group whose team didn’t have gym control or contribute the most in battle. Which Pokémon do I need to use against Mewtwo? Of course, this could change based on which fighters are your strongest and have certain move sets. But, again if you don’t want to worry with what to choose, just let the game do it for you. How many people does it take to defeat Mewtwo? We had groups of 11 and 12, both of which were more than enough. 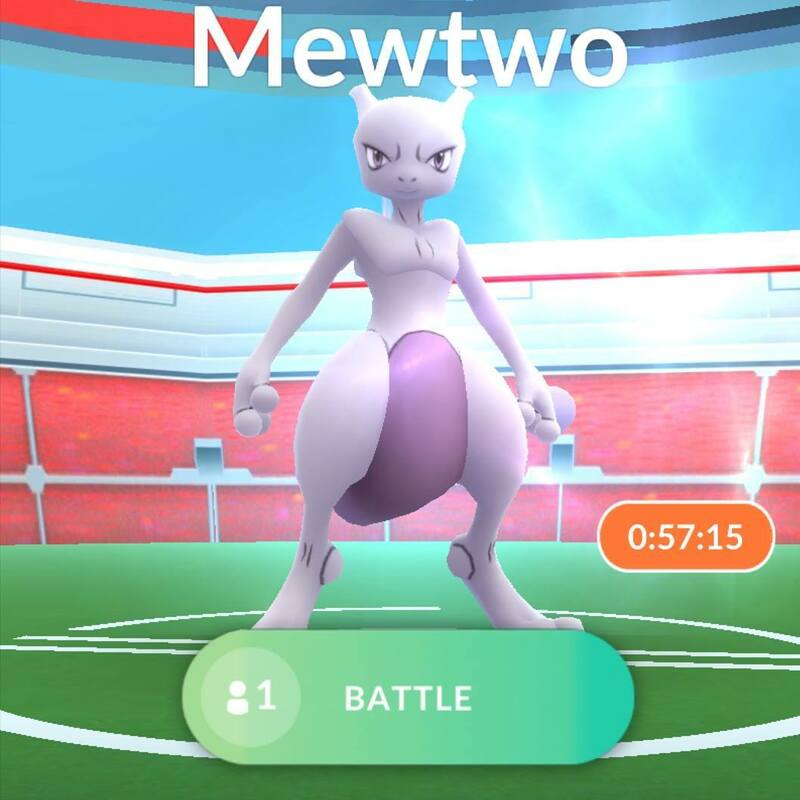 The group of 12, level 30 and above players, took down Mewtwo with 216 of the 300 seconds left on the clock. The group of 11 defeated him in 120 seconds. What are my chances of catching Mewtwo? Out of the 23 people that were in our group, 13 caught him. If I catch a Mewtwo, will I get one with good stats? As with all other raids, it’s hit or miss as to whether your Pokémon will be strong or simply amazing. What is a perfect Mewtwo? Based on just the CP, it appears that if you catch one that’s 2275, he’s probably going to be perfect. We actually had 2 of our group of 23 to catch one that was 100%. Is there anything I can do to ensure I get an invite, in the future, when the EX Raid becomes a permanent part of the game? Our best advice is to continue to be active in gym raids, big and small. You won’t know ahead of time where an EX Raid might be scheduled so participating in as many raids as possible, at different locations helps make your odds better of receiving an invitation from Niantic. Overall, the EX Raid was an exciting experience. We were happy to have this chance to capture Mewtwo and see so many players (including ourselves) add him to their Pokédex. We also greatly appreciate Niantic for creating a way to reward those who’ve been faithful and active Pokémon Go players, through this special type of event.